Well, it so happens that it's my forty-wunth birthday today, lol! I already know how lucky I am just to have a space of my own for me to work in and I have always SO appreciated that. But anyway, as it happens Paul was very happy to redesign it with me! Wow! It's the perfect birthday present!! DUST: Coming mainly from the carpet! Dust and oils are NOT a good combination! LIGHT: You wouldn't believe that you could have too much light in a room would you? But you really can! 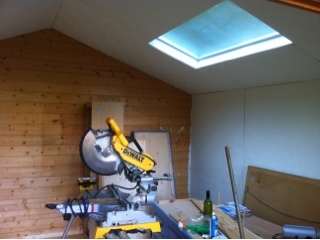 Having already put a daylight strip-light and diffuser in there for dull days, last year Paul also put two skylights in the roof which made a wonderful difference to the light in the room. The unforeseen problem was that when the sun came out, it turned in to a greenhouse and glared so brightly on to my working area that there was at least two hours during a sunny day that I couldn't paint at all! NO WATER SUPPLY: This was probably the biggest draw back of all. The garden is quite long and I used to trek up and down the garden time after time, sometimes to fill up my pots, sometimes just to wash my hands and sometimes just to wet a cloth so I can clean up! Great for burning calories but not so great if you just want to get stuck in to a days painting! NO INSULATION: This means it got really cold in the winter. I had to run the heater constantly when I was in there. In contrast, in the summer it became unbearably hot! WOODEN WALLS AND CEILING: The darkness of the wood absorbed the light and it felt a little oppressive. So, on a mission to turn my 'Art Room' into an 'Art Studio', Paul is, as we speak transforming it completely for my most perfect birthday present EVER! The carpet is being replaced with vinyl floor covering, which will massively reduce the dust problem! 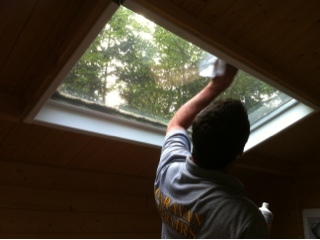 The skylights have been frosted so that the sunlight diffuses through them softly. Paul is running a mains water supply down there with a sink and taps! I am SO excited about this! 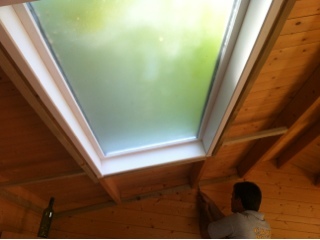 The room is now insulated to keep it cool in the summer and warm in the winter. 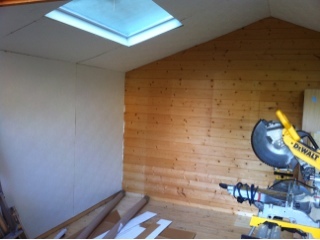 The wooden walls are being boarded out in white, which will bounce the light around the room. 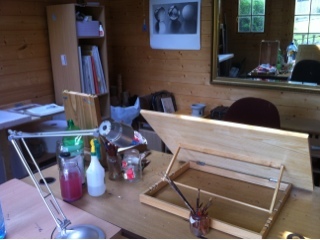 A large square table with one side always set up for watercolour and drawing and the other always set up for oils and acrylics. Well, I am feeling suitably spoilt! I can honestly say that I am SO grateful for what he is doing for me. He is just the best husband! 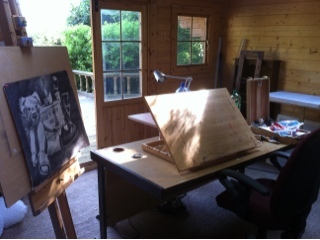 So, here is my art room at the bottom of the garden. 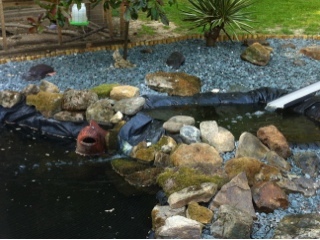 And while Paul began work on the room its self - I began working on the view from it - the pond garden! 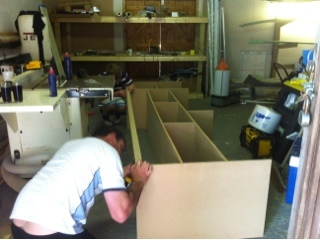 So, today the floor is going down, the walls and ceilings will be trimmed up and the drying shelves will be put in. Hopefully, by the end of next weekend it will be almost complete! I'll take some more pictures as it progresses. Meanwhile, the bear who is so nearly finished is safely tucked away waiting to go back on the easel. Absolutely stunning and how EXCITING Sandra! Congratulations on your lovely studio and a BIG congratulations on your birthday! You're still SO young! lol! Thank you Maree! Hmm, and yet hurtling towards middle age at an alarming rate! Or am I already there? Eek!! Ciao Sandra, how I wish to have such a place to paint! Hugs! Well done Paul & Charlie. It sounds as if it's going to be ideal, Sandra. The insulation is key, isn't it? I had the cook/freeze scenario up in the 'hutch'. But in my new location there's no problem in that area ... but ... I do get an hour of white out from too much sun. Dear Sandra ... the happiest of HAPPY BIRTHDAYS to you!!! Paul and Charlie are doing a great job, and your surprise looks like it will be the ideal studio. I can hardly wait to see more photos. Hi Sandra and a happy birthday to you! Wow, what a fabulous birthday present!I know what you mean about having to run up and down the garden, skipping over the dog poo as I go, to empty out the dirty water jars and to get more clean water! I do have power and lighting out there though which is good for all the gadgets, most of all the radio :) I use a large industrial anglepoise lamp, fitted with daylight tubes, for when it starts to get dark. Maravilhoso essas fotos do seu studio. Happy birthday, Sandra! And congratulations, you lucky girl, what a wonderful art studio!! BLimey Guvvna! I never said HAPPY BIRTHDAY! birthday and congratulations on the beautiful studio! Je suis certaine que votre joie fut grande avec ce bel atelier... Un lieu rien qu'à vous! I'm so looking forward to seeing how yours looks when its finished. Don't keep us waiting too long, hey? Happy B-day! and congrats on the new studio. It's looking fantastic! Happy Birthday, Sandra!!!! Wonderful pictures of your soon-to-be studio. SO exciting! I look forward to some more photos!!! Spoiled indeed! Happy Birthday!!! Wonderful studio and pond. belated happy birthday! and what a fabulous present! husbands that can do handy work are the best! your garden is amazing and your art studio is such a good size. i love mine but it could fit in a corner of your and I may need another on soon just to store finished canvasses! the running water is the best idea, mind you its only about 10 steps from my studio to the kitchen door so i may not really need it as much as you would! hope you had a fantastic day-we are both children of '71! Thank you Nicola! But you look so young!! So, when is your birthday? I loved your posts about your new studio. It was inspiring and gave me lots of ideas - so hubby can blame you, lol! Crickey Sandra, I'd give my right Van Gogh for that! Happy Birthday to you! What a wonderful present! 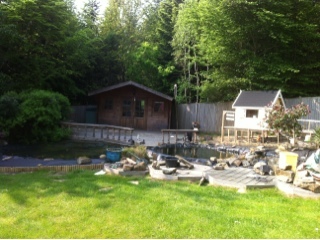 I'm getting really jealous, not only because of the studio, but also because of the pond! I've tried to persuade my mum to have one in their garden for the last 10 years, but without success. 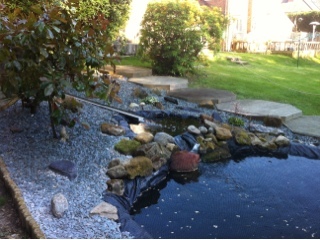 If I'll ever have a garden of my own, there'll definitely be a pond in it! 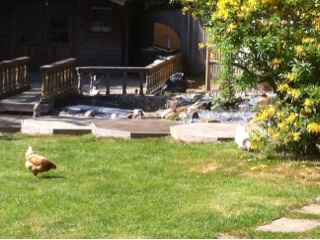 Well, actually my landlady's garden has a pond, but it's so small you can hardly see it. Running water is essential, I think. Makes things so much easier. I hate to always having to use the kitchen or bathroom sink. 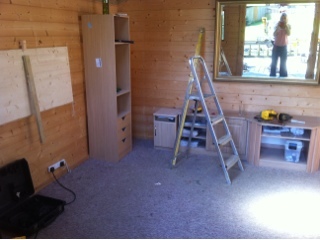 Looking forward to see how your studio will look like when it's finished! Thanks so much! Maybe you could dig a pond without your Mum looking, lol! I like the trickling sound it makes - So relaxing. sandra ...enjoy your new space .... bet you can't wait to move back in now ... looks like your husband and son are doing a brilliant job ....what a wonderful 40 th ! Lots of hard work going on here. Good luck.